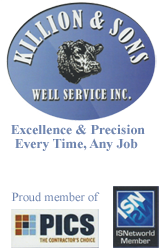 Killion & Sons Well Service is the local provider of Professional services for the Marcellus Shale that include but is not limited to. Production testing and monitoring of gas and oil wells. Technical maintenance of production equipment. Killion & Sons also offers a wide variety of roustabout services that include. Oil and gas equipment rental and delivery services. Killion & Sons Well Service is a company committed to excellence that strives to build strong relationships with our clients in order to earn the reputation as the “ only call “ for services being provided to the Pennsylvania, Ohio, and West Virginia areas. Completions through Production, Killion & Sons delivers quality services throughout the life of a well. 2323 US HWY 84 E.